'Reports of China setting up electronic eavesdropping posts at Gwadar to monitor US and Indian naval activity lend credence to this,' says former RA&W officer Jayadeva Ranade. The claim recently by a Pakistan navy officer, who chose to remain unidentified, that China would deploy its naval ships along with the Pakistan navy to safeguard the strategic Gwadar port and trade routes, reveals the growing concern in Islamabad about the security of Gwadar port and facilities constructed around it. The remark merely underscores the existing enhanced Sino-Pak military collusion. The expanding cooperation between the Chinese and Pakistani navies was publicised recently with Islamabad's agreement in August this year to purchase 8 diesel submarines from China by 2028 and conclude the largest-ever military sale by China valued at $5 billion. Hinting at the potential of future Chinese military support, a People's Liberation Army Navy nuclear submarine called at Karachi port in late May. This was the first-ever visit by a PLAN nuclear submarine at a port in South Asia. For China, the Gwadar Port is central to the China-Pakistan Economic Corridor. In November, Beijing acquired an additional 2,000 acres of land in Balochistan for the development of Gwadar port. Strategically located just 250 miles from the Straits of Hormuz and through which nearly 40 per cent of the world's oil supplies flow, Chinese officials view Gwadar as an energy hub offering critical access to key shipping lanes which allows China to ensure the security of its crude oil import routes. China has a strategic objective too and has discussed plans with Kyrgyzstan and Afghanistan to provide them an outlet to the sea by linking them to the railway stretching from Xinjiang to the port at Gwadar. Chinese officials say China will use Gwadar as part of the Maritime Silk Route -- Chinese President Xi Jinping's flagship geo-economic initiative -- to enhance trade and commerce. Gwadar also has the potential to facilitate PLAN's operations in the Arabian Sea and Indian Ocean and, reports of China setting up electronic eavesdropping posts at Gwadar to monitor US and Indian naval activity and shipping traffic through the Straits of Hormuz and the Arabian Sea, lend credence to this. As part of the CPEC, China is investing an estimated $1 billion in projects centered on Gwadar, which includes an airport. 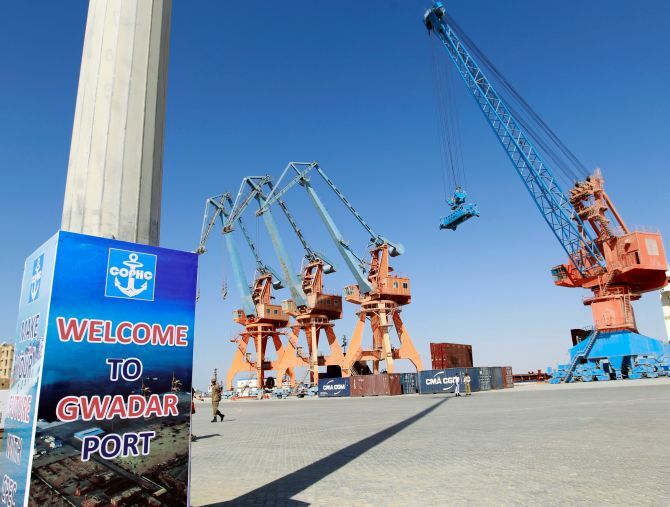 China's specific interest in Gwadar became further evident when earlier this year Beijing sought to assuage Pakistani annoyance at the high interest rates and slow pace of implementation of projects by saying the cost of projects around Gwadar would be grants. In an article in January 2015, Chu Yin, an associate professor of international relations at Beijing's prestigious Tsinghua University, advised China not to take smaller countries for granted. On a regional level, Chu said, India, the US, Russia, and Japan are all important players in One Belt One Road countries and could use their power to block China's plans. Separately, Jia Qingguo, a member of the Standing Committee of the Chinese people's political consultative conference and dean of the University of International Relations at Beijing University, pointed out that many of the target countries for the Maritime Silk Road project are currently involved in territorial disputes with China, which may make them reluctant to cooperate. Former PLAN Senior Captain Li Jie, presently a senior researcher at the Chinese Naval Research Institute in Beijing and reputedly an influential voice in China's naval strategy development, in Military Digest pointed to India as a potential threat to China's maritime trading routes. India's objection to the CPEC and announced support to the Balochi people in their struggle for human rights have put the CPEC at risk and unnerved China. China's insistence that India 'ease tensions with Pakistan and resolve the Kashmir issue' has also not been heeded by Delhi. In a bid to garner broader international support for the CPEC and defuse India's objections, Beijing is now trying to interest other countries to join and acquire a stake in the project. So far Russia, Turkemenistan and Iran have shown interest. Some US academics and former US administration officials, presently working in think-tanks, have separately recommended that the US administration join the CPEC so that US companies could benefit. Such a development, if successful, will complicate India's position on PoK, Gilgit and Baltistan.